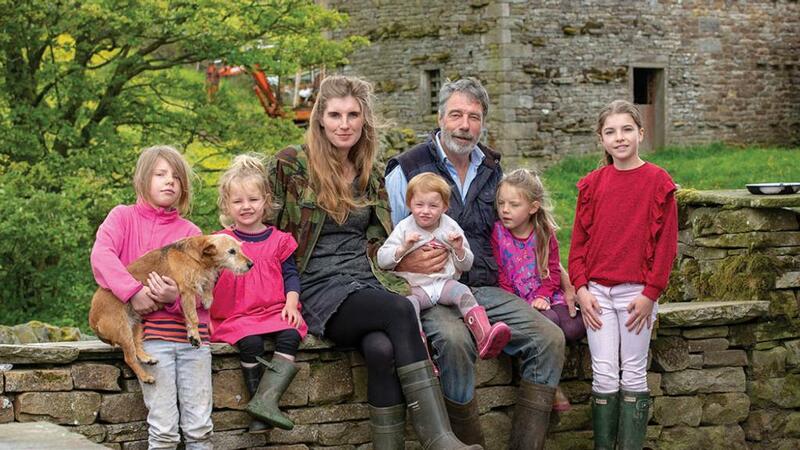 With family at the heart of many farms, Emily Ashworth takes a trip onto the Yorkshire Moors to find out more about one particularly unique story. Life is never quiet for Amanda and Clive Owen, where family is very much at the heart of their farm. For miles around, there is only silence, met with moody skies which often lie over the iconic North Yorkshire landscape. It is a vast panorama to witness and one which provides you with a sense of complete solitude, yet just a little further up the track sits Ravenseat Farm, Richmond, a hive of life set deep in the hills and home to Amanda, Clive and their family. The faint sounds of children’s laughter can be heard from down the lane and, once inside the farmhouse, there is an overwhelming vibrancy, as some of them gather around the table. Located halfway along the infamous 192-mile ‘coast-to-coast’ walk, the family of 11 comes across walkers from all over the world most days. They are sometimes inundated with visitors, says Amanda, and in the kitchen, there is an abundance of freshly baked scones, all ready to be offered to hungry travellers. Each year, 16,000 walkers pass through what is essentially the family’s back garden and can purchase a cream tea for £3. It is a welcome source of interaction for the kids, who revel in taking the change to customers and talking with them. Growing up in such unique surroundings, the children are still part of a working sheep farm and help to manage the 1,000-head sheep flock at the heart of their enterprise. Although there are certain aspects of the daily routine needing to be done, such as getting the children to school and making dinner for everyone, involvement from all the family is key. “We work together on everything, otherwise it wouldn’t work. Some things have to happen, such as tending to the animals, but I can clip and you can change nappies,” Amanda says, looking at Clive, who nods in agreement. Clive says: “The children like to be involved. They love being a part of it all. It is total chaos sometimes, but good fun. Hailing from Huddersfield, Amanda’s father was an engineer and her mother was a model and administrator. Amanda always wanted to work with animals, having spent hours reading James Herriot and The Hill Shepherd by John and Eliza Forder. After completing an NVQ in veterinary nursing, Amanda went on to various shepherding and lambing jobs from the Salisbury Plain to the Lake District. Her arrival at Ravenseat Farm, however, was never part of the masterplan. It started by helping another farmer, who, unbeknown to Amanda, had lent Clive a tup each autumn to run with his flock. After returning the tup, she admits she never really left. Clive started at the farm in 1980, after securing a lifetime tenancy with the owner of the Gunnerside Estate. 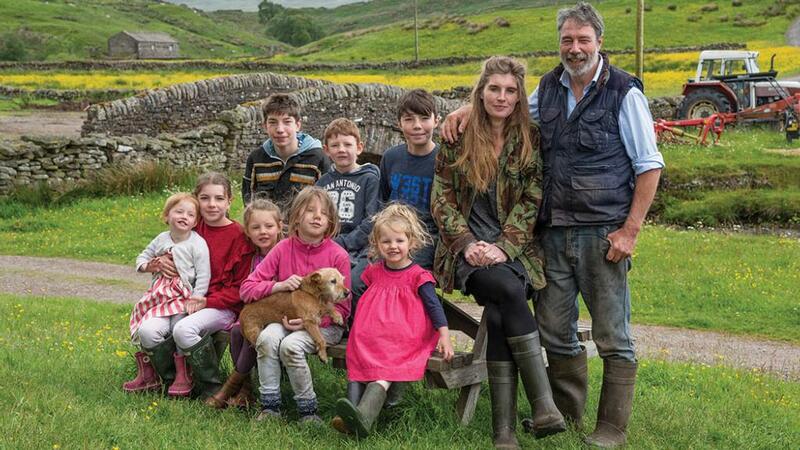 The couple now manage Swaledales on 809 hectares (2,000 acres) and believe this way of life sets their children up for the future, as well as allowing visitors a chance to partake in a real farming experience. Bringing their brood up rurally has serious benefits, says Amanda. The family are 50 miles from the nearest large town, 30 miles from their nearest takeaway and 25 miles from the supermarket. Amanda says: “There is nothing cutting edge here. We bake our bread in the oven and have a big dairy which is full of stuff. We rear our own meat and I visit the supermarket once every few weeks. “You can’t get more real. There is life and death and everything in between and people might think we are isolated, but the world comes to us. The question of who will eventually take over the business does not seem to faze them either and, as with most things, they take a ‘what will be will be’ view of it, knowing each member of the family is completely individual. To live remotely and raise nine children is part of the Owen family’s evolving story, but as they both like to say, you do not know where life is going. Amanda and Clive farm their sheep across a traditional and extensive system with little input. They allow sheep to thrive in a natural environment, preferring to keep a ‘watchful’ eye on their flock, and only intervening when necessary. They believe large diversifications are not options for all farmers, with Amanda’s own success deriving from the simplest of actions: inviting people in for a cup of tea. It was through a chance meeting that she ended up filming with Julia Bradbury, which eventually led her to signing an award-winning book deal. She has since written two best-selling books and appeared on prime time television, along with developing a staggering presence on social media. With more than 40,000 Twitter followers to her name, there is a clear fascination with how she and her family live. The Owens also provide on-site accommodation in the form of a shepherd’s hut, just a stone’s throw away from the farmhouse, and promise nothing but a home-made breakfast and the stunning Swaledale countryside. Amanda says: “Not everyone can do the farm shop or the campsite. Look at what happened to us, all from offering people a cup of tea. Throughout the morning you catch glimpses of family life at Ravenseat, from the breakfast table chatter to seeing contented faces out and about in the fields, donning wellies and overalls. It is so apparent growing up in this environment instils responsibility and character in a person. Amanda says: “Farming gives you an idea of being able to do things and allows you to feel empathy. “It allows you to become adaptable to all sorts of different situations and ensures you are ready for things when you explore what is out there. “You could spend 20 years in education and not come out with an ounce of savvy and people are surprised when they see us all here. They don’t expect the children to be like they are. “People don’t think of family farms anymore, they think industrial. 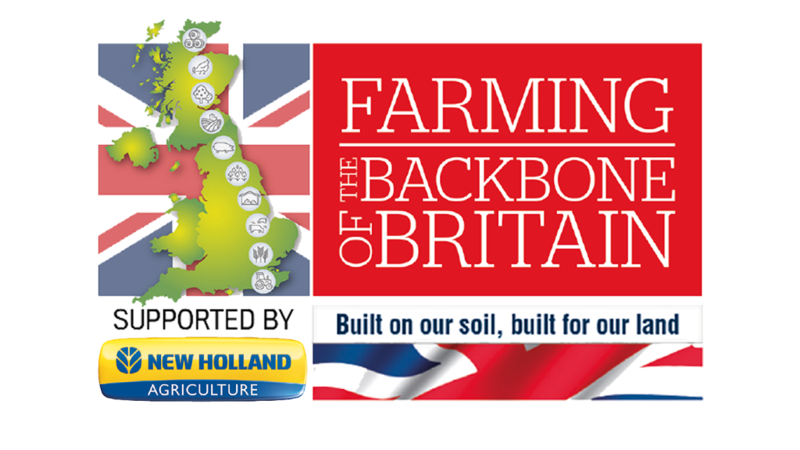 “There are so many others out there just getting on with their own thing and, by doing what we are doing, we hope we can bridge a gap between the public and farming.